When HTC gave us the brief of bringing to life the ‘squeezy selfie’ function on the HTC U11, we jumped at the chance. Literally. 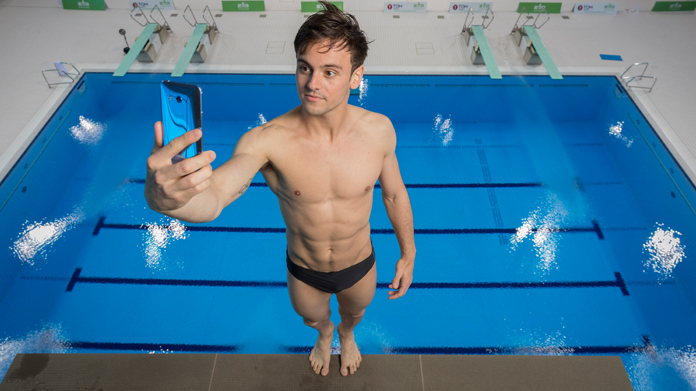 Enlisting the brilliant Tom Daley, we created the trend of ‘extreme selfies’, brought to life by Tom using the HTC U11 to capture selfies whilst performing his world-famous dives. The team created stunning video content of Tom testing out the U11’s camera from the dizzy heights of the ten metre board at London’s Aquatic Centre. This was supported by beautiful imagery of diving’s golden boy taking selfies during a reverse rotation ‘gainer’ dive – a world’s first we believe! The selfie itself, alongside all this brilliant content resulted in a cracking picture story, with coverage featuring full campaign messaging. Coverage included Metro, Daily Star, Daily Mail, Metro and Gay Times amongst many, many others. Over 45 pieces were secured in the UK, however media across the globe loved Tom’s selfies too with a heap of Chinese, Spanish and Italian coverage including Vanity Fair Italy. Alongside this, Tom’s organic social posts on the campaign achieved a huge 56,046 likes on Instagram and Twitter combined. With an interview with Press Association due to be published soon, watch this space for even more coverage going live. We love the quirky nature of this campaign and it’s great to see we’re not the only ones – with PR Week voting it as the Best PR Campaign of June.